This organically textured set is handcrafted in a way that makes each one a unique experience. In the arid hills of Portugal grow orchards of beautiful, twisting carob trees. Designer Samuel Reis drew inspiration from an unusual characteristic of these trees—their trunks become hollow as they grow. Reis uses the natural texture of those interiors as a unique mold for his gorgeous glassware. Samuel's decanters are made by pressing the molten glass into a specially prepared slice of carob tree. Each segment of trunk can only be used to press a limited number of bottles, as the heat burns away at the wood, giving each piece a one-of-a-kind shape. The spout is then fitted with a natural cork stopper. For the glasses, Samuel uses the carob trees in a similar process to form a durable, stainless steel mold, ensuring that each one has the perfect volume and diameter for enjoying your favorite beverage. 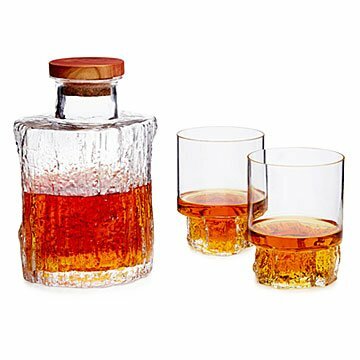 Paired together, the decanter and drinkware offer a sophisticated, organic experience for eyes and hands, which can’t help but enhance your drinking experience. Handmade in Marinha Grande, Portugal. Samuel Reis is a Portuguese product designer born in Lagos. He graduated in Industrial Design in 2011 and received his master's degree in Product Design from ESAD (Caldas da Rainha) in 2014. Samuel entitles himself as a re-collector and through observation he explored how to use nature as the root of the creative process, aiming to identify characteristic forms and elements that already exist in nature and unique properties of the matter. Glasses are dishwasher safe. Remove carob wood top before placing carafe in the dishwasher.